Share the post "Online Benefits"
♣ Online Transactions skip printed paper-bill by default, and automate the proof of payment. ♥ Online Advertising is much cheaper than on-site advertising, and available for 24 hours everyday. ♣ Online Business decreases number of vehicles visiting your stores, maximizes your operation hours, and simplify the way to describe your business. ♥ Online Security increases your business trust level, and get more clients easily. 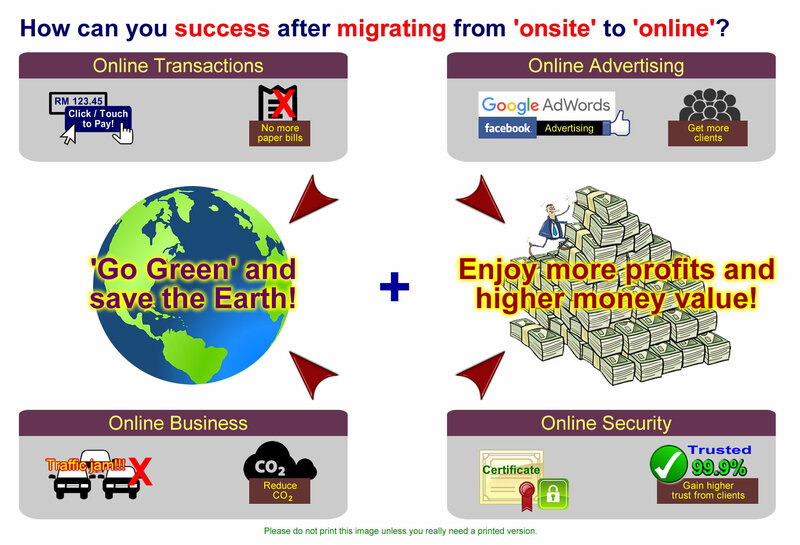 All businesses have 1 goal, that is success, and the best option to success is by migrating from onsite to online business because it gives your more benefits. Imagine that your transaction reports are automated, your products and services are advertised 24 hours everyday at a cheaper cost, your clients can reach your website at anytime they wish to, and you get new clients easily because of a high trust level. Congratulations, you are one of the Go Green supporters and contributors because you choose to save a piece of paper, which is made from the tree! May Allah bless you for this good hidden value, and help you to success in your business.